Puracyn Review and Giveaway! | So What? I run. 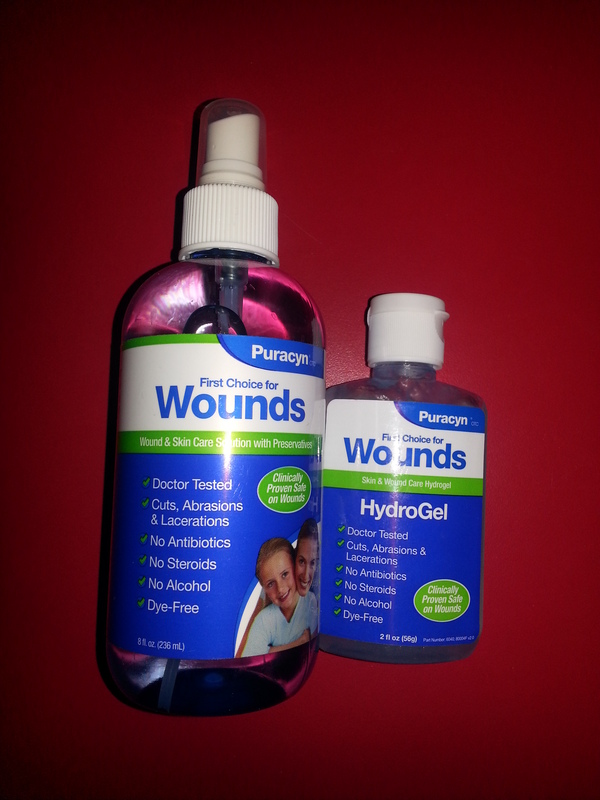 I was excited when I was contacted by Puracyn to try their wound and skin care products. As you know, I tend to fall here and there on trail runs and I’m now a regular for cuts and scrapes. I have to admit that I never heard of Puracyn until they reached out to me and I had to look them up to see what kind of would care it was and what made them special. Umm, okay, so what does that mean to me? Sounds good, but will it work? 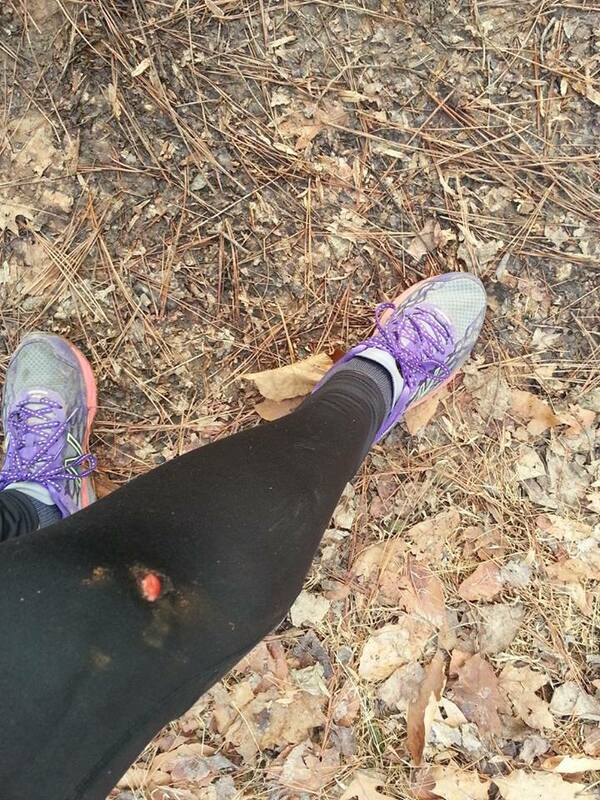 Do you remember when I had that nasty spill on New Year’s Day where I busted up my knee and ripped my favorite running tights? Well, I received the Puracyn package just days after and started using the gel. When I applied it, it didn’t burn or sting. What I really loved is that it kept my scab flexible. 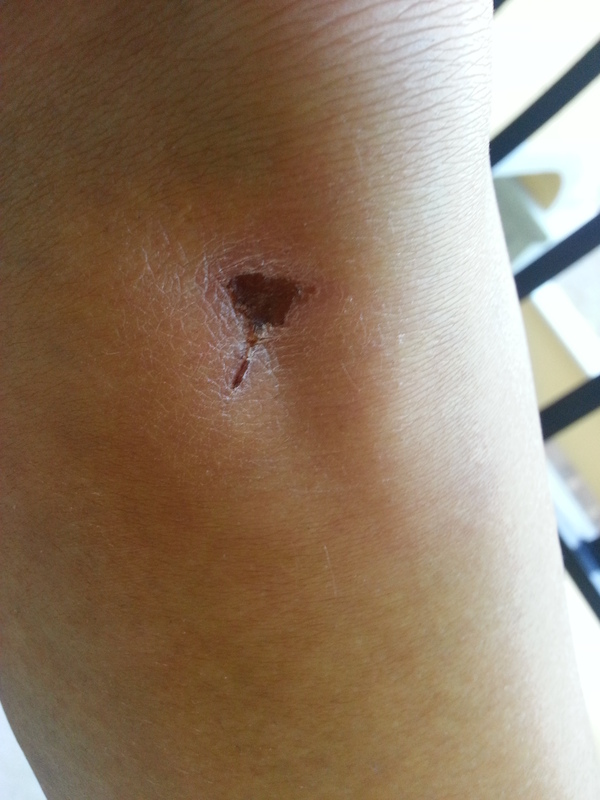 I know, gross, but because the scab was on my knee, it kept ripping back open….again, I know gross. As Puracyn states, “Puracyn-based hydrogel products contain over 95% water. Moisture supplied to the wound by these gels creates a moist wound environment that re-hydrates.” The gel did just that. The one morning when I forgot to apply the gel, could feel the tugging of my scrape all day long and it was quite annoying. I couldn’t wait to get back to apply the gel. 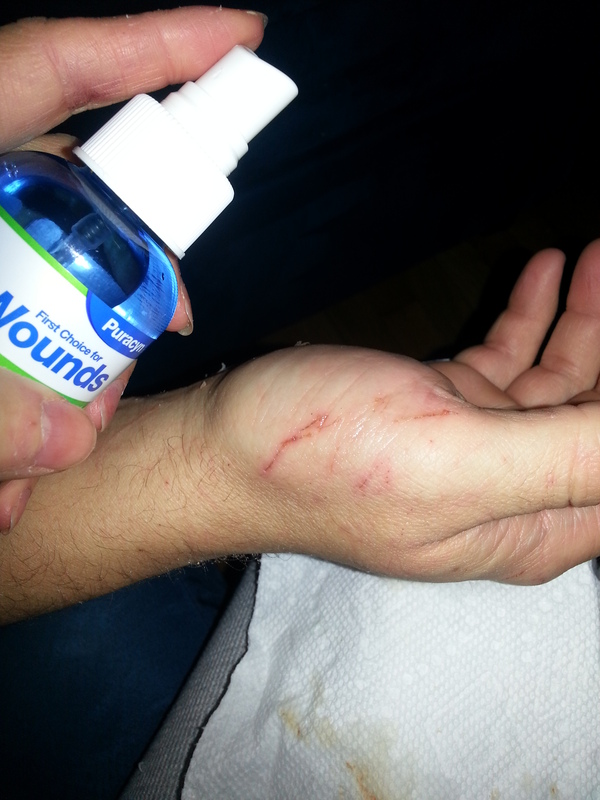 I also used the cleansing spray on my husband who is a machinist and is constantly getting cut or scraped. He said it didn’t sting or burn and he thought that it did a pretty good job of cleaning out the wound. Of course we applied the gel on him too and he was happy with the results. Now runners…you know how we get that awful burning chafe? Even water burns when it touches freshly chaffed skin. I tried it on my ribcage area where I chafed on a recent long run and was surprised with the results. No burning or stinging and my wound was quick to heel. While I didn’t recieve a sample of the foot wash, it retails for about $24.00. So, how many soles would I give this project? 4.5 out of 5 Soles. My only recommendation to the manufacturer is to sell the product in small travel sized containers. I would love to attach it to my hydration belt or toss it in my hydration vest during a long trail run. Don’t forget to enter into the drawing for your own Puracyn prize pack by clicking the Rafflecopter link below! HINT: You’ll need to know WHERE you can purchase Puracyn near you! Disclosure: I received product for review purposes. No other compensation was exchanged. All opinions are my own. This entry was posted in Product review and tagged giveaway, Puracyn by SoWhatIRun. Bookmark the permalink. Considering that I appear to be getting roped into trail runs whether I like it or not, I have a feeling I’ll be needing some of this. ha! I keep some in my running bag now. Love it! I would find it at Walgreens! And would love to have some on hand for my kiddos. They are always getting hurt! I could find it probably at Target or walmart? Very cool! I could’ve used some of that after my recent tumble. Luckily I had some sanitizing wipes when I got back! Ooh yay I have a Walgreens near me!